I live by that mantra because nothing is worse for a marketer than working like crazy on a campaign and then having people not be able to see it. Just this morning, I found a perfect example of that problem. 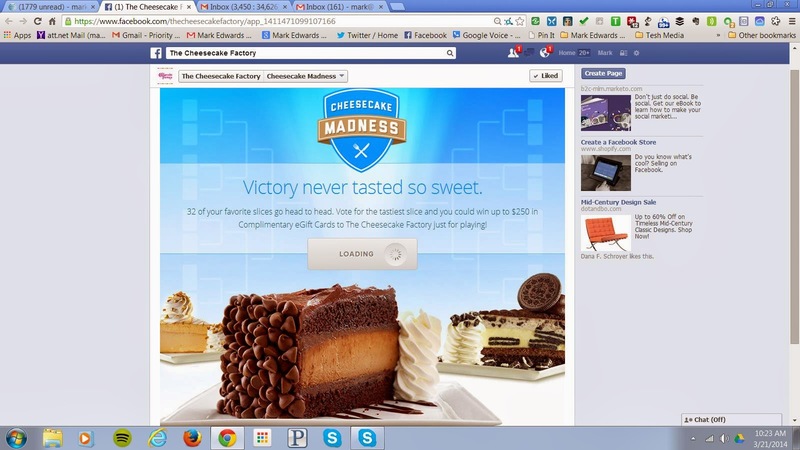 I got a well produced e-mail from The Cheesecake Factory saying I could win up to $250 in gift cards in their “Cheesecake Madness” promotion on Facebook. Now, I’m not one to turn down free cheesecake (although I personally prefer Eli’s Cheesecake from Chicago) so I gave the link in the e-mail a click and found myself on the contest page. And this is what I saw for about five minutes. THE EVIL SPINNING “LOADING” CIRCLE. I use Chrome as my main browser, and for whatever reason, this contest page doesn’t play well with Chrome. The kids on the Interwebz call that a FAIL. I don’t know if the good people at the Cheesecake Factory or Socialtyze (who is credited with designing the page) did the right amount of testing, if my browser is somehow blocking the contest page (which it shouldn’t as I have it set to let just about everything short of a virus or launch code load) or what the problem was. All I know is that as a consumer, I couldn’t play the game and I’m kind of bummed. Was this a testing problem? Maybe. Was it avoidable? Probably. Would very thorough testing on different browsers, platforms, OS‘s, and devices have prevented the user experience I had? Most likely. I’ll say what those who work with Mark Edwards Worldwide have heard me say over and over, TEST AND TEST AGAIN. It’s well worth the time to make sure what you post, especially on platforms you don’t control like Facebook, render and work the way you want them to. By the way, I just checked the page in the screenshot above. The little “loading” circle is still spinning. Ugh.